New Zealand Aims To Be Rid Of Rats, Stoats And Possums By 2050 : The Two-Way For decades, New Zealand has tried to reduce the populations of destructive, non-native predators. Now the country has a more ambitious goal: eliminating invasive rats, stoats and possums by 2050. At Ulva Island Bird Sanctuary on Stewart Island, New Zealand, a sign warned visitors in 2008 to check their bags. The fight against invasive predators continues. 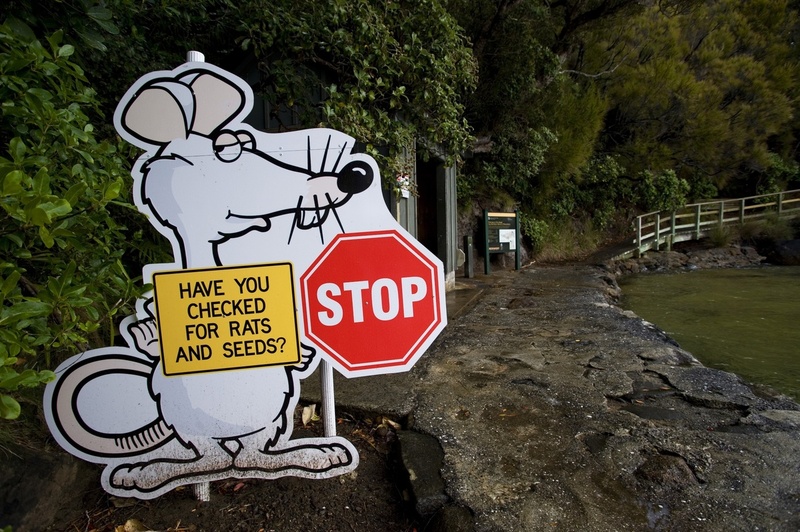 When it comes to invasive predators, New Zealand smells a rat — and a stoat, and a possum. By 2050, the island nation hopes to be rid of the invasive mammalian predators — completely. It's a goal that was formally announced Monday by New Zealand's prime minister, John Key. "While once the greatest threat to our native wildlife was poaching and deforestation, it is now introduced predators," Key said in a statement. He noted that rats, possums and stoats — which are not native to the islands of New Zealand — kill 25 million native birds each year, and also prey on lizards and other native species. The invasive species cost the country about 3.3 billion New Zealand dollars (more than $2.3 billion) per year, according to the government's estimates. They can also carry disease. Eliminating all invasive predators is "the most ambitious conservation project attempted anywhere in the world," Key wrote, "but we believe if we all work together as a country we can achieve it." The project relies on funding from the federal government, local governments and the private sector. The national government is kicking it off with an extra NZ$28 million (just under $20 million) on top of the tens of millions already spent on pest control by the government each year. New Zealand has virtually no native mammals — bats, along with ocean-dwelling dolphins, seals and whales, are the only exceptions. The native plants and animals, including kiwi birds and land snails, didn't evolve with mammalian predators, which means invasive species can have a devastating impact. Rats were first introduced to New Zealand by Maori settlers more than 700 years ago, when they were used as a food source. Those rats — called kiore — are believed to have promptly wiped out a number of local species. But the kiore were then nearly eliminated, in turn, by the arrival of more aggressive Norway rats and ship rats, accidentally carried in on European ships. Stoats were introduced intentionally — to control the population of invasive rabbits and hares. Rabbits had themselves been introduced for food and for hunting, but grew so populous that there were soon "rabbit plagues" overwhelming the country. Stoats and ferrets were brought in for relief. But, as one conservation nonprofit notes, New Zealand's native animals "proved much easier to catch than rabbits." Oops. New Zealand has been battling its invasive predator problem for years, with traps, bait, hunting and aerial poison drops. "With its predator-free islands and its fenced-in reserves and its massive poison drops from the air, New Zealand has managed to bring back from the very edge of oblivion several fantastic birds," Kolbert wrote. "Meanwhile, by tackling larger and larger areas, New Zealanders have expanded the boundaries of what seems possible." But at the time, eradicating predators from the entire country seemed like too much for even Kiwi aspirations. Kolbert quoted a scientist who — practically on his deathbed — called for the country to go all in on elimination. "Let's get rid of the lot," Paul Callaghan said. "Let's get rid of all the predators — all the damned mustelids, all the rats, all the possums — from the mainland. ... It's crazy, [but] think it might be worth a shot." He knew it was ambitious, comparing his idea to the Apollo mission. Two years later, the government has officially agreed on the moonshot proposal. And they've given the vision a timeline: 34 years. With fences, poisons, traps, grass-roots support, new technology and a ton of funding, it might not be as crazy as it sounds. "It is doable, and not that hard," Kevin Hackwell, an advocacy manager from the Royal Forest and Bird Protection Society of New Zealand, told The Guardian. In fact, he said it might be manageable in as little as 25 years. "The biggest hurdle in the end will be public support for the project," he told the paper. The importance of citizens' buy-in might be one reason why the press release announcing a "Predator-Free New Zealand" only mentioned rats, stoats and possums. It left off any mention of another invasive mammalian predator — one with much better PR. Gareth Morgan, a businessman, activist and philanthropist who has strongly advocated for a predator-free New Zealand, also runs an initiative called "Cats To Go." It tries to persuade New Zealand's cat-lovers to keep their pets indoors or walk them on leashes — and, when they die, not to replace them. And all unowned or unclaimed cats in New Zealand should be euthanized, Morgan argues. His position has sparked claws-out debate about the future of cats in New Zealand. For now, the government is hinting toward a hard line on feral cats but not on house pets. Under the government's new program, Prime Minister Key told Radio New Zealand, feral cats on conservation lands would be targeted as predators, just like rats, stoats and possums. But he said family pets, like his cat Moonbeam, "have plenty of years in front of the fire at home."